Catherine was the daughter of William Fannin and Hanera Cormack or Macormack. She would have been born and raised at Lissaroon. Her siblings that I know of were: Michael who married Catherine Ryan and took over the farm at Lissaroon, Patrick who married Margaret Cantwell and farmed at Lisdonowley, William “Billy” who lived at Clondoty and was married to Catherine Fogarty and Mary who was married to Thomas Evaston of Clonomocogue. 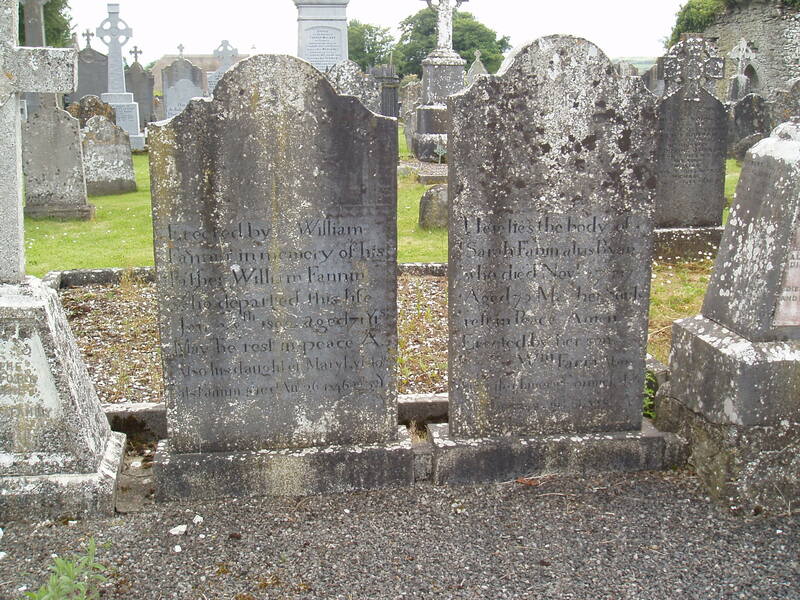 Catherine Morrissey nee Fanning was married to Daniel Morrissey in Drom Parish on 22 Feb 1838. 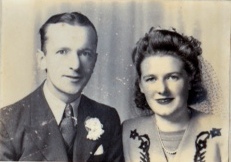 The witnesses at their wedding were Thomas Cormack and Catherine Fanning. Her address was given as Lissaroon. 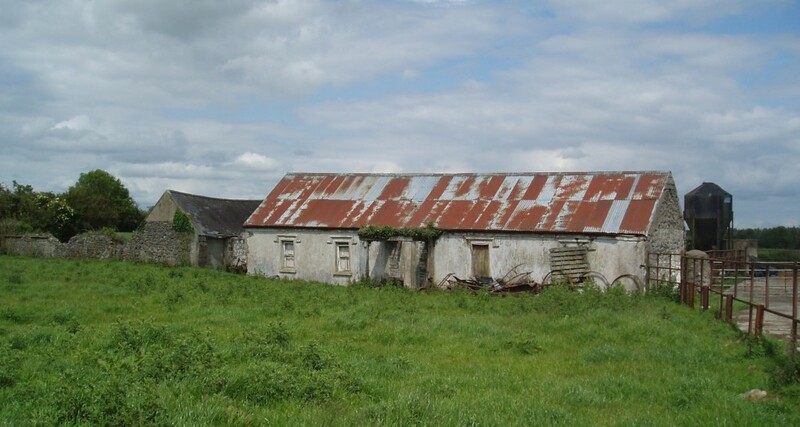 Tipperary Family History Research found records of eight children all born in the parish of Loughmore or Loughmoe in Co Tipperary. 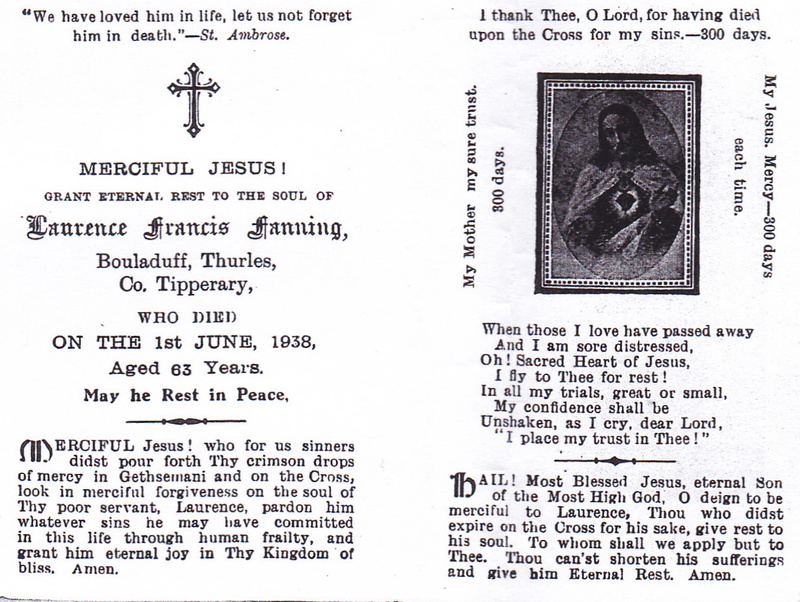 Bridget Morrissey was baptised on 17 Mar 1841 and her sponsors were Patrick and Sally Fanning. 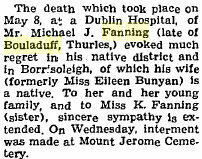 Judy (Johanna) Morrissey was baptised on 21 May 1843 and sponsored by Michael and Judy Fanning. 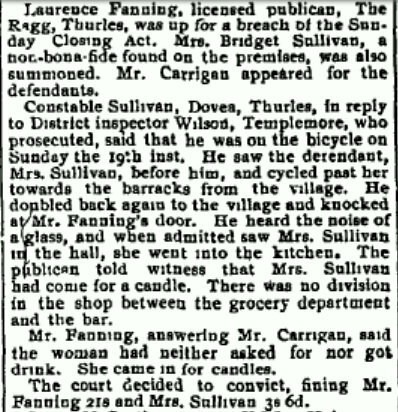 She married Michael Burke in Loughmore Parish in 1861. 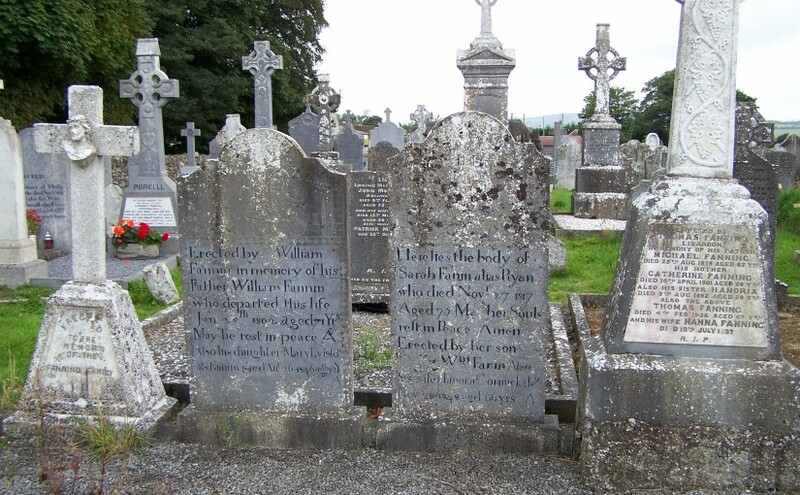 Honora Morrissey was baptised on 26 Dec 1844. Her family address is given as Kill. 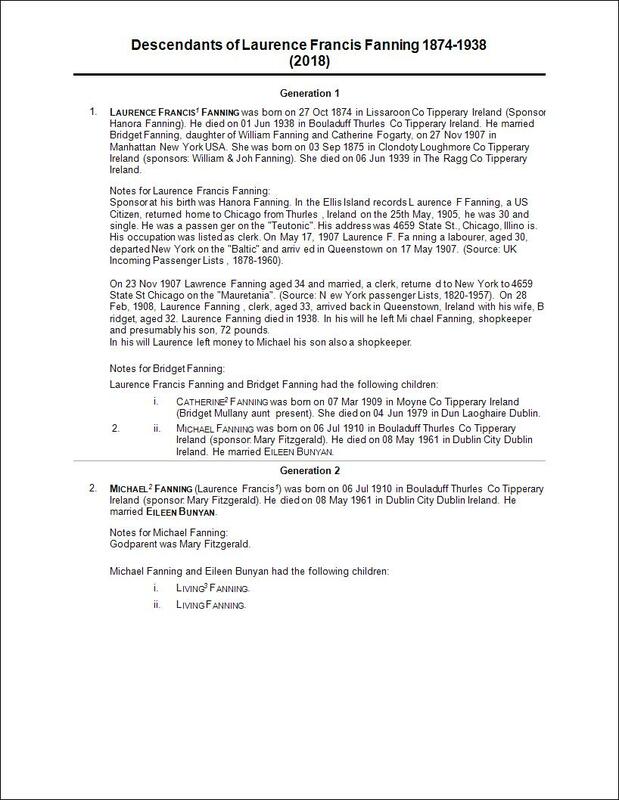 Her godparents were Edmund Fogarty and Mary Fanning. Their next child, Mary was baptised on 28 Dec 1846. The address listed is Kill. Sponsors were William and Johanna Fanning. 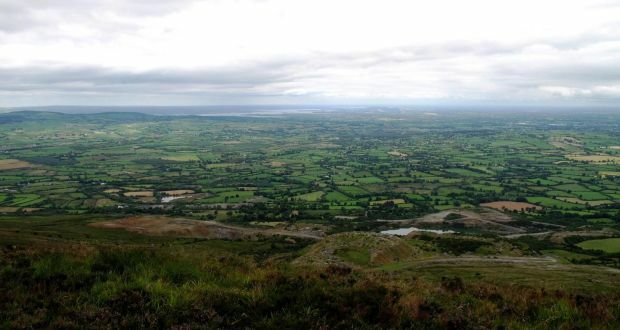 Catherine Morrissey was baptised on 17 April 1849. Address is Kill and Catherine MacGrath was the only sponsor. 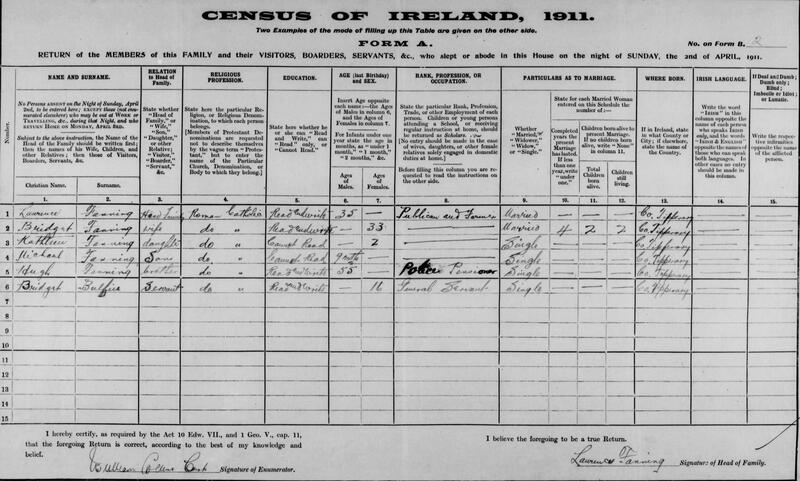 The baptismal date for Margaret Morrissey was 11 June 1851 and the address was Kill. She was sponsored by Tom Fanning and Margaret Eviston. Daniel Morrissey was baptised on 8 Aug 1853. His sponsors were Patrick Eagan and Judy Ryan. The home address was Kill. William Morrissey was baptised on 22 March 1856. James Morrissey and Catherine Fanning were sponsors. Catherine died shortly after giving birth to her last child William. 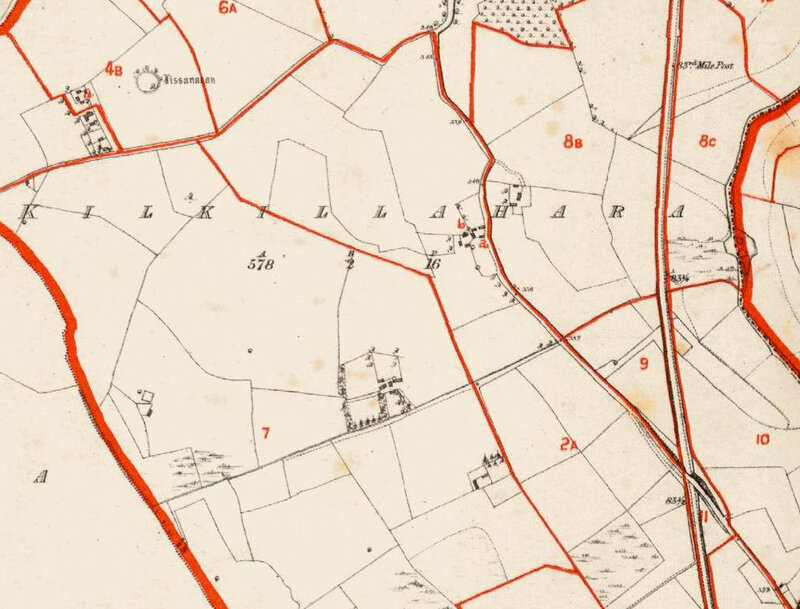 On Dec 9 1845 Daniel Morrissy of Kill was listed on the Rate for the Relief of the Poor of Thurles Union for Loughmore West. 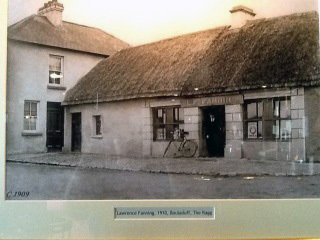 Danial Morrissey in Grifiths Valuation for Kilkillhara Loughmore West Co Tipperary Ireland. I have been unable to find any marriages or death records for Daniel or any of his children. Just found the marriage of Judy to Michael Burke. 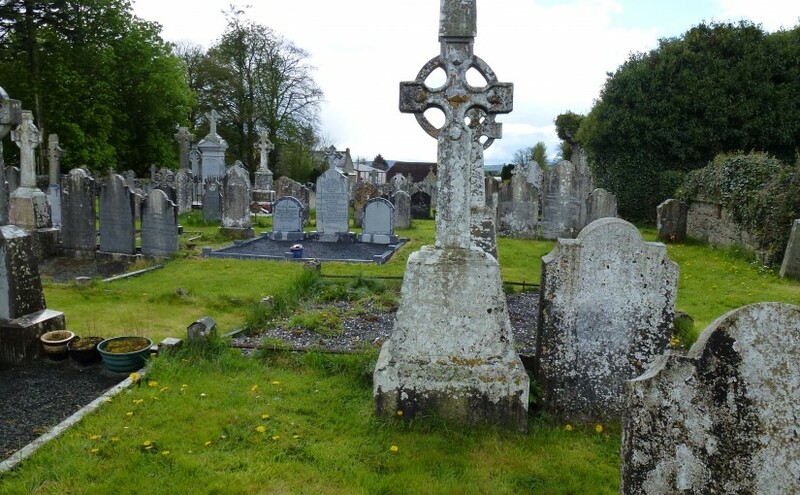 None were buried in Loughmore Cemetery. Perhaps their graves are in Drom Cemetery. I also haven’t been able to find them in the 1901 Census. If anyone knows where they all ended up or has any more info on this Morrissey family please contact me. 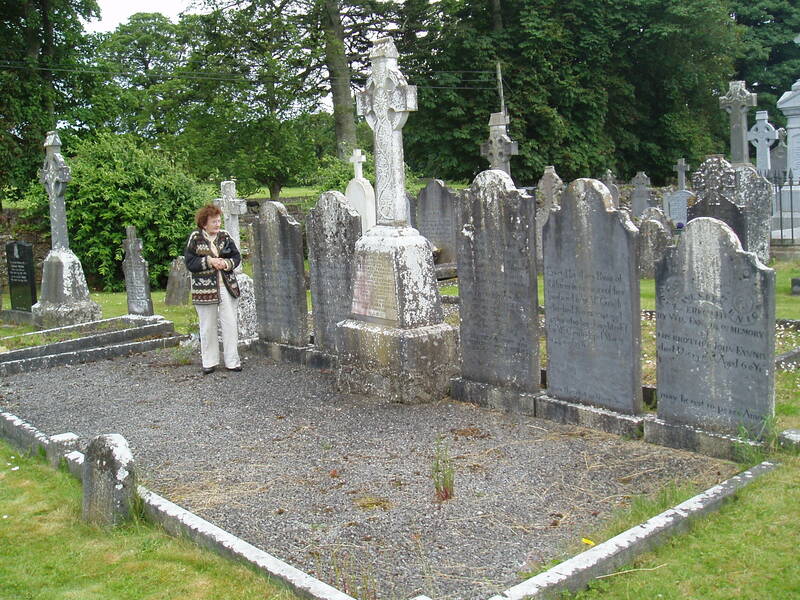 Ballycahill Cemetery Co Tipperary (North) is beside an old church in ruins and also has an active graveyard. It is on the main road (R503, the Anglesey Rd) Map co-ordinates S065 597. 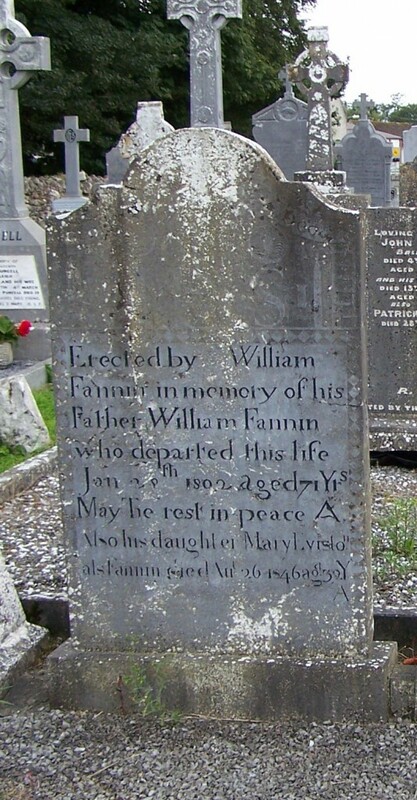 Many Fannings/Fannins are buried. 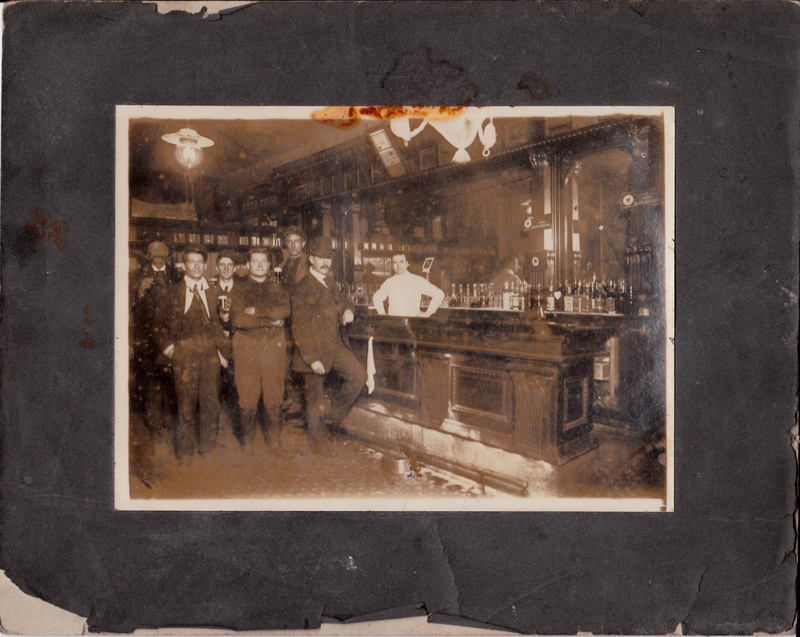 There are photos and details on the McGrath Genealogy site.